"I looked out the window & what did I see? Popcorn popping on the apricot tree!" At night when we are laying in bed, he looks at me and says "pacorn", makes circles with his fingers and puts them over his eyes like he's "looking out the window". I must say he's getting pretty good at shaking his little finger during "It wasn't really so...." I'm realizing I've been singing the song wrong. I've been singing "but it seemed to me" (Henry loves pointing to himself during this part)....but I love watching, so I think my screwed up way is going to have to stay! That song always reminds me of this apricot tree we used to have in our backyard here in Southern California when I was a kid. I passed a street the other day called "Apricot Lane" and I started waxing nostalgic. We had 2 big avocado trees too, and this giant avocado picker that looked like a really long broom handle with a little bag on the end & some clippers so when you cut them off the tree, they'd fall gently into the bag. We used to cut the avocados in half and sprinkle them with salt and eat them with a spoon right out of the skin. But you won't catch me waxing nostalgic when I eat guacamole or anything. Just when I think of apricots, since it's been years since I've actually eaten one and I don't know why. Onto the Spring rolls. People. I am not kidding. These are a keeper (I can say that because I did not invent these little bundles of goodness.) There is this wonderful Vietnamese place in Boston called Pho Pasteur that we used to go to all the time. They'd make these Spring Rolls and serve them with this yummy peanut sauce. I always wished I knew how to make them (mostly the peanut sauce) and don't know why I didn't try sooner. We've been eating them for the past 2 months served with the Cherry Chicken Lettuce Wraps & Coconut Rice. They are quite simple and I think I've even mastered the peanut sauce. Find a local Asian market and you really just need the first 2 ingredients from there. I found mine at a Japanese market (on Sawtelle for you friends & neighbors!) and everything was so reasonably priced. I think I paid around $4 total for the vermicelli & spring roll wrappers. And that is for a LOT of spring rolls. Everything else, you can find at a regular market. These have an incredible fresh and simple way about them, perfect for a spring or summer day. Fill a large saute pan with warm water & set aside. When everything has been prepared or mise en place as the French say, (soaked, julienned, etc.,) you are ready to assemble! Take 1 Spring Roll skin and place it in the saute pan to soak for about 20-30 seconds. Let excess water drip off and lay on a cutting board or counter. 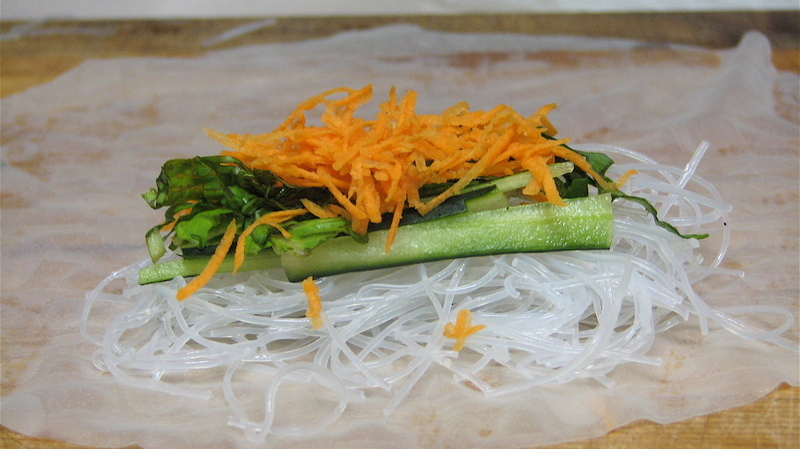 Place a handful of vermicelli noodles on the bottom center of the Spring Roll skin, as shown in the above photo and layer on some of the herb mixture, cucumbers & carrots. If you decide to use cooked shrimp or meat, add it here. Starting from the bottom, roll the bottom of the spring roll over the ingredients and pull down slightly (similar to rolling sushi), pull the two sides into the center & continue to roll (like egg roll). 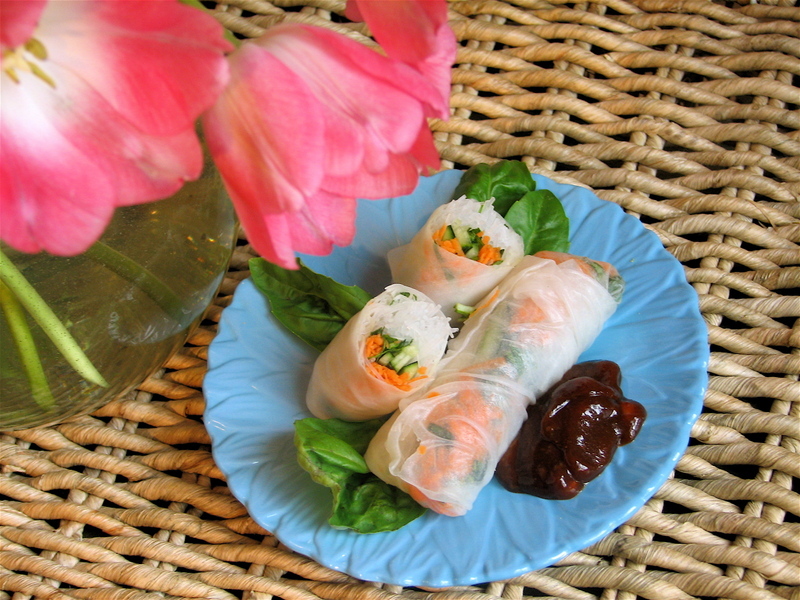 Continue with as many wrappers as you want to make and Voila, you have your Spring rolls! It is best to make these just prior to eating them as they do not store well. I know there is a bit of preparation, but, trust me, they are worth it! Add all ingredients together and warm (either on a stove top or microwave) until the peanut butter melts into the mixture. Allow to cool before serving with the rolls. Enjoy! Things here are crazy as usual so I need a bit of a blogging break. Now that Chris is officially done with school (Hooray!! His last class was a few weeks ago) we need to move and are looking for a new place. It's no fun at all. Keep your fingers crossed that we'll find something soon. It's been a bit of a nightmare. Lots of changes. Lots of stress. Lots to do. No time for blogging. No time for crafting. Wah. 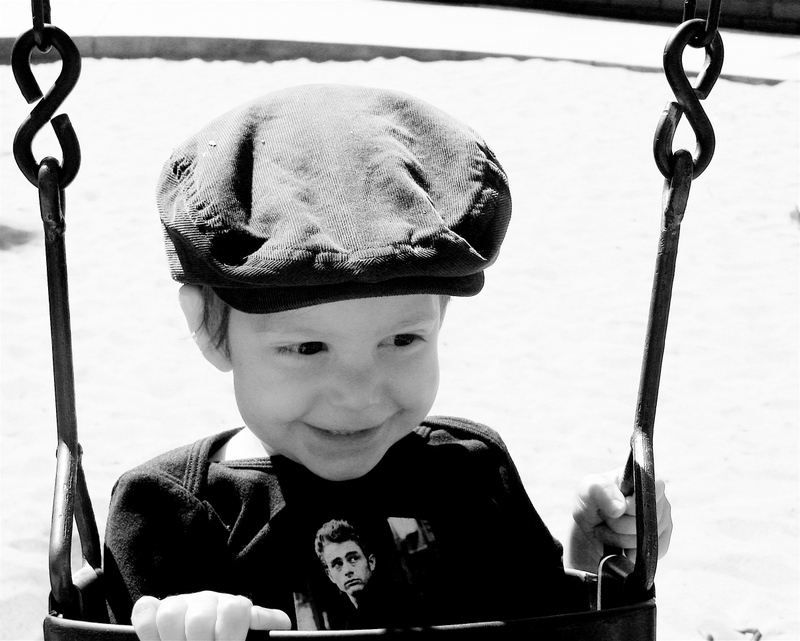 But there is always time for swinging and I'll be sure to get lots of that in.